Explanation: I went to Garrett Evangelical Theological Seminary, in Evanston, IL, 1978-1980. I loved seminary and learned there what I would need to know to live my life. Paul Hessert taught dogmatics. I still use every day in my thinking, writing, and living – wisdom, perspective, and courage I learned from Hessert that year. Several other students were as moved to be in Paul Hessert’s classes as I was. One of those students was Penny Penrose who went on to become a United Methodist minister. Years later we would actually become emailing friends until she died way too young. This is an unofficial memorial I wrote about her, for her sister and other members of her family. Garrett is the graduate school of religion at Northwestern University in Evanston. 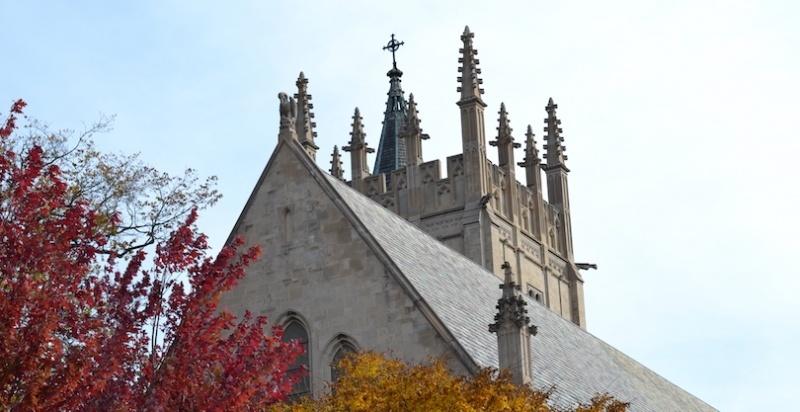 It's a Gothic-architected place with view of Lake Michigan from its east-facing classrooms. I've been thinking of Penny Penrose often these past few months. I don't have anything in particular to add to the sum of Penny's amazing life. I guess it' okay for me to meander in some thoughts here. I'm smiling. She was A Penny for Our Thoughts. She was good at poking people to see and think. My disclaimer is this. I wasn't Penny's friend. Well, not back when we were in the same geography. My only physical memory of Penny is this and I wrote it to her awhile back. For those of you who were there, remember that classroom next to C305? We met in it pretty often during Spring/1979. The room had about 30 desks; the walls were yellow. The east wall was almost entirely mullioned windows, making the space sort of Gothic, sort of Oxford, very beautiful. If there had been a Harry Potter back then, we would have recognized the room as the sunny side of Hogwarts. Outside those windows was a huge tree. In the Spring (was it only That Amazing Spring that the light was like this?) sunlight poured out of the sky to smash into flying smithereens of light all over Lake Michigan. Those flying light-shards then snap-whizzed through that exuberantly green tree, clamored through those beautiful windows, bopped against the yellow walls, dazzled all over us, dripped like honey through Paul's lectures. When I said in Paul's eulogy that I could never remember organized thoughts, but I could remember the way the light fell in a room - that was the specific room I meant. When I die and head down that corridor of light, I think I'm going through that yellow room at Garrett, 1979, first. And Paul and his eyebrows will be there. That room is where I figured out what I needed to know in order to live my life. I "got it" there. It's where I understood that since I am already forgiven, nothing I do makes any difference. Therefore I should just give what I've got, enjoy it as I can, love with what I've got in my stingy Swedish heart, see and taste and laugh and make-do with what's in me, be restful about what I don't have. There is nothing to win or earn. The story is already over. I am loved, the deal is done, now it's all about spending my human life as generously as I can, with passion and respect for others. Okay, I've got some tears in my eyes here. It was a pretty big Spring for ole' MB. So the only physical memory I have of Penny is this. In that light-whacked room - she is one row behind and to my right. When I turn and look over my right shoulder, she is smiling and laughing at me. She knows exactly why I'm crying and laughing. God's almighty forgiveness which shatters our lives -- then gives it back in shimmering shards of light? I can hear Penny. "Been there. Done that." That is my only seminary memory of Penny. My first published piece was a pretty-good, too-long story from when Len and I and some others accompanied Guatemalan refugees from Chicago to Cincinnati. In a nutshell, we'd joined an activist UCC church in Chicago that was the first North American Sanctuary church outside the Southwest. A family of Mayan refugees stayed in our church two weeks and then went on their wending way to Weston Priory in Vermont. This journey was traveling via a Protest Caravan. Each leg of the trip included about 5 to 20 cars, all plastered with posters. We North Americans would drive our cars in front and behind the van that held the Excots and their five little kids. It was a powerful, fun, noisy, soul-fluffing adventure. I wrote about it and "The Other Side" published it. Within a month or so I heard from someone this story. That there was a guy with a white collar job in the Washington DC area, who read my story and it was the camel that broke the straw's back. He quit his job and went to work full-time for the Sanctuary Movement. His pastor, or at least the person he talked this over with, was Penny Penrose. I heard this from another one of us who had been so profoundly moved by Paul Hessert - and hearing this gave me the Mystical Willies. I did my thing, a guy I'd never met was moved, the person on the other side of him was Penny, behind and to my right, giving me her smirk of understanding. I like to imagine what that moment was for Penny. Talking to some guy who was flipping out. He's carrying a magazine article. She looks down. It's me. God sows. We stand around like cows studying a new fence (Paul's metaphor). "Moo. What's this now?" It was through Paul's memorial service that Penny and I were reconnected. Or would that simply be, connected? Since we'd never really talked much before. We started emailing. I have saved a fair amount of her letters to me. What I responded to was not her body, which carried so much of the pain and couldn't-ever-be-finished-ache of her childhood. But her spirit, which was Wicked Funny Good. Lord, she could make me laugh. No apologies. Gum-smacking attitude I could hear from my basement in Wisconsin. Justice-determined. Little kid melt down mushy. Rainbow-hungry. Fierce in her family love. Proficient in her professional world. And then back to her disdain for what doesn't work; her empathy for people who were being screwed and disrespected. Her unending enthrallment to little kids in general and Kayleigh in particular. I don't know what it was like to be her family. I bet it wasn't always simple. I bet sometimes it overwhelmed with love and protection and need. I do know what it was like to get emails from her. My heart slowed down. I knew I was okay and I was heard before I opened her letter; like God's grace that knocks me over. There was never any sense that I could embarrass her, make her weary or bored. When I saw her name in my in-box, I was greeted before I read a word. I always smiled. Sometimes I laughed. The freest part in me felt invited to a very good party, every time I saw her name. So that is what I have to say. Behind and to my right, in a light-whacked place. There she is. Ballsy, laughing, unafraid, counting on us to love our lives, too.